The SD card with the correct software was missing when we bought our Dremel 3D20 (it was a bargain). But I found the “Dremel Idea Builder” software and a firmware update on their website, and that allows me to load STL files, and send them to the printer via USB cable. Unfortunately, the “Idea Builder” software has no option for adding supports to a model. Supports are needed so that the nozzle doesn’t print filament over an empty space. However, Dremel now offer a new Slicing software called “DigiLab Slicer“. This is easy to use, and has options to add supports, rafts, skirts, change the print quality, and do the slicing. It saves in .gcode format. It is based on the open-source Cura software. This is all good news … except that Idea Builder doesn’t like .gcode files. It needs its own special format of .g3drem. 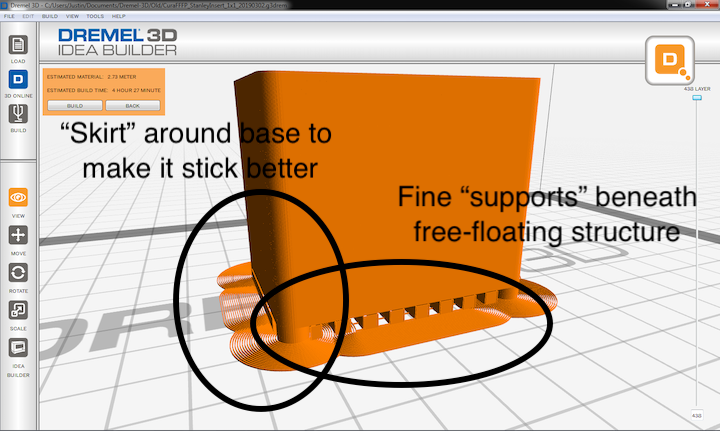 And DigiLab Slicer doesn’t save in .g3drem format. It would appear that I’m not the only person with this problem. Dr. Peter Falkingham, university lecturer in vertebrate biology prints models of animal bones for use in his lectures. And he has had the same problems: most slicing software can create .gcode files. but how do you create a .g3drem file? Update 15 March – I emailed Dr. Falkingham, who clarified that the latest firmware allows the 3D20 printer to read .gcode files off the SD card. The problem I experienced exists when printing from the “Idea Builder” software via USB cable: “Idea Builder” does not read .gcode files. Further online searching revealed that others had the same problem too. One guy wrote a plugin for Cura that saves to g3drem format. A quick installation of Cura, then a visit to the Cura Marketplace (from within the Cura software), and the plugin is installed. It isn’t supported by Cura, it comes with no warranty, except that your printer might catch fire, but I’m happy with that. So now I can create supports for the model from the STL file, save it as a .g3drem, and load that into Idea Builder to send it to the printer. Except that the nozzle is blocked. That’s a job for another day. This entry was posted in 3D printer and tagged 3D printer, 3D20. Bookmark the permalink.